A five minute walk, (or drive your car down in 30 seconds), to Pleasant Point Beach on Kezar Lake in Center Lovell, Maine, Birch cottage has three bedrooms, and two full baths. 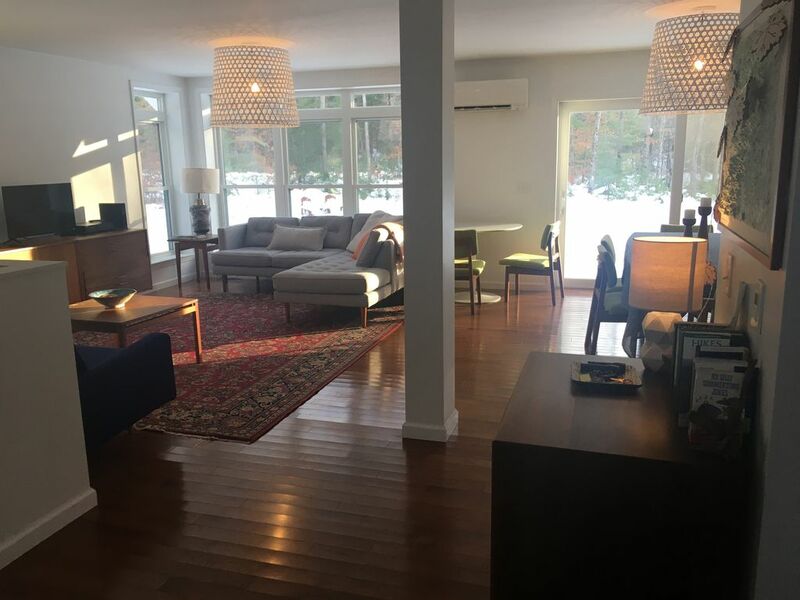 The main living area is open concept with beautiful mid-century style furnishings, and seating for plenty! We have a large deck on the south side of the cottage, and a front porch on the north side for keeping cool on a hot Maine day, (yes, we do get them)! We also have a stone patio with seating, and a fire pit. For those who love their technology, we have unlimited wifi. Kezar Lake is known as one of the most beautiful lakes in Maine. Pleasant Point Beach looks out over the White Mountains of New Hampshire, and is a wonderful place to sit in the early evening and watch the spectacular sunsets with a cup of tea, or a cocktail. Or sit around the fire pit in the evening and tell ghost stories to each other, as you hear the haunting sound of the loons in the distance! Like a brew? Ebenezer's Restaurant and Pub, is famous for its’ incredible selection of craft brews from around the world. If golfing is your thing, the Lake Kezar Country Club, is two miles up the road. The Center Lovell Market, within walking distance from the cottage, has a seasonal restaurant that serves breakfast, and lunch, as well as food from local farms, groceries, a deli, liquor selection, souvenirs, and an ATM, while still retaining massive charm! There is also a fine art, craft, and jewelry store close by: The Harvest Gold Gallery. Within a 30 minute drive or less, are the outlets in North Conway, NH, and the shops of downtown Bridgton, Maine. There are tennis courts close behind the Charlotte Hobbs Memorial library; a beautiful well-appointed place to spend time. During the fall, Lovell and its surroundings are a beautiful starting off spot for leaf peeping in the mountains, either on foot or by car; enjoying the beach at its' quietest; or enjoying local fairs. The Fryeburg Fair, which began in 1851, and takes place in every October, is just a 15 minute drive! For the winter enthusiasts, Shawnee Peak in Bridgton is a 15 minute drive, and Sunday River in Newry, Maine is a 40 minute drive. You can also cross country ski or snowshoe on the lake, or at the Kezar Lake Country Club! We look forward to your visit to Birch Cottage! We are a family of four with two teenagers, two cats, and 8 chickens. John grew up in Nashua, NH, and Joni grew up in Eliot, ME, which is where we currently live in an off the grid solar home! We have daily visits by wild turkey, deer, and various other woodland friends, some of whom are friendly, and some of whom think our chickens would make a nice meal! We bought this property because we wanted to be closer to the mountains, (we are a skiing and hiking family). We like that we can walk out of the door of our cottage and spend a great day without ever getting in our car. For a relaxing, low stress vacation this is the place to be. There are restaurants, a well stocked market, hiking, a library, golfing, and performances, all within a couple of miles away. The beach is within walking distance if all you wanted to do was swim and lay in the sun for an entire week. Or you can get in your car, and tour the area, enjoying the local attractions 15-30 minutes away. At the end of your day out, you relax on the porch, or have a beverage at the beach as the sun sets! Must use a calling card to make long distance calls. There are sheets, pillows, and pillow cases, and of course blankets, and bed coverings. We have unlimited wifi. Receiving phone call and texts on a cell phone however, does not always work. It's usually a stroll up the store to get good cell reception. Bath towels are provided. Beach towels can also be provided if requested. We have an induction cooktop. We have an induction/convection oven. We will provide paper plates, paper napkins, paper towels. The television is wi-fi enabled, with an hdmi cable to stream from your computer. A bluetooth compatible device is available. We have books for all ages. We have games for all ages, cards, and puzzles. We have a limited amount of toys. We have building blocks, and some toy dishes, and frisbees. We have a good assortment of videos and DVD's, including family and children friendly titles. We have a large lawn area, that we are working on improving, as well as slowly landscaping the area. We have a canoe, and 2 kayaks on carriers that may be wheeled down to the beach. We are still working on where to store bicycles for renters use, but we will have them available. No tricycle yet. There is a marina close by that has power boat rentals. We have a large back deck, and a front porch. We also have a stone patio, with a fire pit. Shawnee Peak, 15 minutes away; Cranmore Mt., 30 minutes away; and Sunday River, 40 minutes away. There is a tennis court behind the Charlotte Hobbs Memorial Library, a five minute drive. Lake Kezar Country Club is two miles away. There is also Highland Lake golf course in Bridgton that is 20 minutes away. Excellent house. Would love to stay here again. More than adequate space, very clean, and great location! We have stayed multiple times and each visit is as great as the last. Winter or summer the location is great for all family activity and the house is warm and comfortable. Plenty of space to enjoy family time and well equipped kitchen to make meals. The yard is great for the kids too! Owners are always very accommodating and make the stay effortless! This home was a great rental! It was everything described in the overview and more. It was off-season and Joni was very accommodating and allowed us to check in a little early. The house was very clean with a very pleasant open concept floor plan. Large windows and doors made the space bright even on a cold winter day. We enjoyed XC skiing a few miles away and went downhill skiing at Shawnee Peak which was only a short drive. The kitchen was well equipped for cooking family dinners for 8. We would definitely rent this property again! Thank you for your kind words, Terri. And thank you for your coffee pot buying skills! Stayed here for the 2nd year in a row and everything was just as nice as the 1st time. Will definitely be staying again! Thank you Derek and Shana! Next year I’ll keep the code confusion to a minimum! We really enjoyed our stay. Beds are very comfortable. The house is well equipped with everything we needed for a wonderful stay! Thank you, Juanita! I hope you enjoyed your stay. This home is absolutely beautiful, set just a short walk from the lake and just a drive from outlets, country stores, Saco River for tubing. We were up for a wedding with our daughters and found everything we could possibly need there - all the comforts and gadgets right at our fingertips. We'd forgotten a corkscrew and found one. Something needed ironing and it was there. The beds are cozy, the table big enough for games. We can't rave enough about this gem. Thank you for your kind words! Our goal is to make a place that is comfortable, welcoming, and easy to use. We look forward to having you back!